Here are the final books in my Library Roulette - Junior Edition challenge. As you might recall, I was not a big fan of the 737 book in my original Library Roulette. I was optimistic that this book would be more interesting, more accessible, and less esoteric. I collected coins as a kid and have some basic knowledge, but this book provided a nice overview for a young collector. I felt like there were a few areas where the author should have given more information and others where less would have been sufficient, but overall I was satisfied with the content. If I have a complaint about this book, it is that the author made some choices that make what could be a timeless book instead very dated. For example, she frequently refers to the "new" 50 State Quarters Program that launched in 1999 and was completed in 2008. (The book was published in 2000.) If she had merely removed the word "new" from each of the places it appears, the book wouldn't feel out-of-date. Recommended: Yes, although I would encourage a young coin collector to make this one of several books he/she reads. 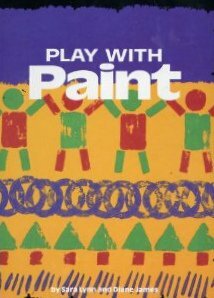 This book has all sorts of suggestions for playing with paint: stamping found objects (see the forks stamped along the bottom of the cover? ), making stencils, stamping with potatoes, splatter painting and so much more. The book is colorful and fun, with fun ideas for easy paint projects. The instructions are simplistic and basic and the projects are suitable for age 3+. Tomorrow I'll share with you the projects that Trevor and I made that were inspired by this book. That paint one sounds really good!! I learn something new every time I come here. I already looked ahead and saw that "tomorrow's" post is stamping with yarn. Fun! Off to read it! I agree with Izzy! I always learn something new every single time I come to your blog, Cindy! Thanks!!!! !